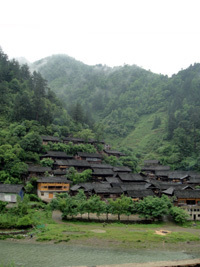 Explore rural China and enjoy spectacular scenery and unique traditional culture of ethnic China. There are numerous ways to arrive in Guiyang from many cities across China. We can help you with flights and additional tour arrangements to suit your exact requirements. The hilly areas we visit on this tour are covered by azalea groves. In late March and April, the azalea flower is in full bloom and turn the hillsides into a riot of colour more than 30 miles long. This spectacular flower show has confirmed this region as being one of China's most beautiful national parks. Additionally the blooming season coincides with many colourful ethnic festivals with music and dances. After breakfast, meet your guide and take a tour to the Dragon Palace Cave National Park, where we'll explore the vast cave network and underground karst river by boat. We continue our journey to the spectacular Huangguoshu waterfall, which is the largest waterfall in Asia and mystical home to the Monkey King. The stunning Huangguoshu waterfall is 74m high and 81m wide and is where the mighty Baihe River pours into the Rhinoceros Pool below. A highlight is to walk behind the falls through Water Curtain Cave for an unique view of the falls from behind. Huangguoshu Waterfall is located right in the heartland of Bouyei county, where you find clusters of Bouyei style stone houses amongst terraced rice paddies on the hillsides and in the valleys. We will spend some time exploring an authentic Bouyei village and meet the ethnic Bouyei villagers and see their handcrafts. The Bouyei women are renowned as being wonderfully skilled batik artists. They meticulously draw their complex pictures and ethnic designs on fabric cloth with beeswax and then dye the cloth in indigo. A few miles down river from the Huangguoshu Waterfall lies the scenic stone forest area located near Heavenly Star Bridge. Star bridge was formed by a large slab of stone which forms a natural bridge across the steep gorge below. We will walk along winding paths and enjoy the beauty of this scenic area, which has stunning views reminiscent of the natural landscape of the 'Dinosaur roaming' Jurassic period. Stay at the Grand Waterfall Hotel**** in Anshun. Today we drive to Kaili and on the way visit the ancient town of Yunfeng. Yunfeng was founded by an outpost of Ming-dynasty troops, who were originally sent from Nanjing to this remote outpost to keep order and fight against rebellions for the Emperor. Entering the town is like stepping back in time, as it is built almost entirely in stone in the traditional Han style. Even the local residents still wear the traditional Han style costumes and maintain ancient tradition not found elsewhere in modern china. Yunfeng is also known for it performances of a Ground Opera, which is a regional variation of the traditional Han opera originally performed by soldiers during the Ming era. 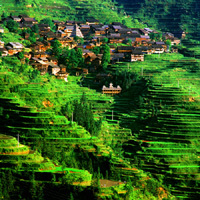 Our tour includes a scenic and leisurely drive through the mountainous countryside of Guizhou enjoying views of rice paddies terraced into the mountain sides, on our way to visit remote Miao ethnic minority villages. 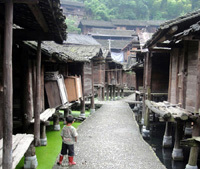 The friendly Mao people are mainly mountain dwellers and their homes are tightly packed wooden structures built on stilts, with balustrades. 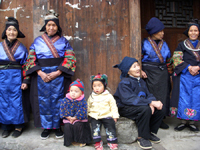 Our first ethnic minority village we explore is Jidao, which is home to the long skirt Miao people. Then by contrast we visit Datang Mini Skirt Miao Village. We have plenty of time to informally meet with local Miao residents and enjoy experiencing and understanding more about their unique way of life and culture. The ethnic villages we visit are not 'tourist destinations' and the way of life and friendly culture is authentic. Therefore we ensure that we visit in a responsible manner to preserve and respect their traditions and culture and make friends along the way. After lunch, you will visit Paika Village, where you can meet local people making the unique Miao's musical wind instrument which is used in their many festivals. You are also free to take an hour walk through the rice paddies along narrow pathways to enjoy the beautiful scenery. This is also a great opportunity to see the farmers hard at work with their water buffalo's in the rice paddies and see the highly effective and ingenious waterwheel irrigation system used by the villagers for their crops. Stay at Heaven-sent Dragon Hotel**** Kaili. On Sundays there is a fantastic morning market in Kaili, which caters for locals to buy and sell a vast selection of exotic goods including clothes, fish, meat, spices and vegetables. This is really an exciting cultural experience not to be missed. Only available on Sundays! Today we drive to Zhaoxing town which takes about 2.5 hours on a new highway. Zhaoxing is one of the largest Dong Ethnic Minority villages in the region, with more than 700 households and a population of 4000. The Dong ethnic peoples costumes and lifestyle is distinct from any other ethnic group. High rise sacred drum towers and roofed bridges and stages for local opera performances are landmarks of their communities. After breakfast enjoy a leisurely walk around Zhaoxing, informally meeting local residents and enjoying the rural atmosphere. Later we take a scenic drive back to Guiyang (approx 4.5 -5 hours drive). Transfer to the airport and take an evening flight to your next destination. 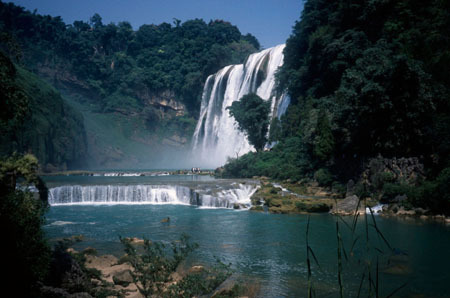 (Alternatively extend your stay and travel overland to Guangxi, Guilin and Yangsuo). Recommended visiting times: 1) Azalea blossom viewing - mid April; 2) Sister's Meal Festival: fair, folk song singing, dancing, hose races- early April; 3) Lusheng Festival: fare, bullfighting, singing, Lusheng dance - November. Please note itinerary may be amended during 2) & 3) period. China possesses 470 varieties of Azaleas, over half of the different varieties of the world. The hilly areas we visit on this tour are covered by azalea groves. In late March and April, the azalea flower is in full bloom and turn the hillsides into a riot of colour more than 30 miles long. This spectacular flower show has confirmed this region as being one of China's most beautiful national parks. Additionally the blooming season coincides with many colourful ethnic festivals with music and dances. Private tours can also be arranged, please enquire. We also welcome group booking enquiries, and discount is available for group over 10 people. All airport/hotel transfers within Mainland China. Flights - can be provided upon your request. Visa fee - We can arrange Visa's subject to your request. Flights: we can assist in obtaining flight tickets. Some of our programmes can also be combined for a longer tour, please enquire at the time of booking. Your Accommodation for this tour: Carefully selected good hotels & guesthouse accommodations. In some remote areas the standard can be lower but we will provide you with one of the best available in the area. Your Meals: As specified in the itinerary. Dishes are using local cooking style with on-season fresh ingredients and vegetables when possible. We think this forms part of the important experiences to visit these charming areas, and experience the authentic, healthy and delicious meals. Other fact of our tour arrangement: Our itineraries are regularly checked, inspected and updated to provide ideal and latest sightseeing spots for our travellers, and we organise our own special activities to try to introduce the real China to you, and connect closer to local people. Small group travel with like minded people and flexibility on tour. Normal group size 10 people. Suitable for all age travellers. The itinerary is designed according to the most updated information of flights available, although on rare occasions the sequence in which cities are visited, duration of time spent can change due to local conditions which are out of our control. The above itinerary highlights the main attractions that are to be visited each day. Further places of interest may be visited during your stay, which will provide unique ethnic and cultural handcraft shopping opportunities. We reserve the right to change, amend or alter the itinerary, although we will act in your best interests to handle any amendments. Please refer to the booking form for detailed terms & conditions. Want to know more? Please Contact Us!